I will share with you my trades for today because I think there are some important lessons to be learnt. Remember there are very few things you can learn when you make tons of money but you can always learn from losses. Let me first share with you first trades for today. I made a loss of roughly 1375 and some brokerage. Important information is not price but the time of my trades. Let me explain first why I took long call and why I was ready to move out of the call so early. It was no magic behind it. Let us first see today’s chart for Reliance. The vertical gray lines in the charts are when I executed my trades. In the morning I expected a correction but saw nifty was making higher tops and higher bottoms for couple of hours. Reliance is one of the heavy weights on Nifty and was showing good strength. I wanted to flip my money for roughly 10k profit. This point is very important because you should understand the objective. My objective was a trading profit and never an investment or a positional call. I was not ready to hold onto Reliance overnight. 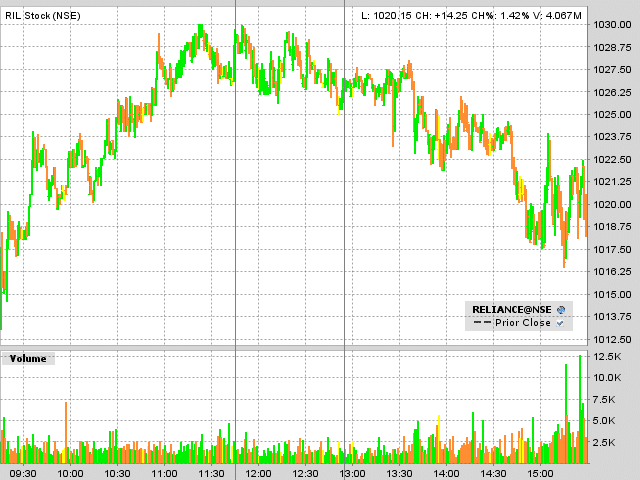 The top of Reliance was 1030 before my purchase and I wanted to see the next peak above 1030 which I did not see. The down tick in Reliance after my purchase was more than previous down ticks but more importantly I saw that Nifty also did not head higher but started to form a lower bottom. Why short position was smaller and not in Reliance Industries? I did opt for shorting but not in Reliance Industries but in Titan Industries because of two main reasons. 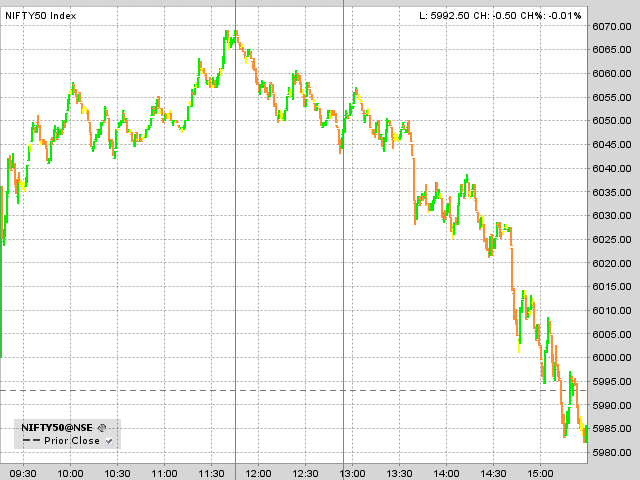 First was Uncertainty at around 1 PM of whether the market can correct and go higher or break supports and go lower. I did not see a clear breakdown pattern yet but somewhere I knew it will go lower. Anticipation is bad and I should have waited for few more minutes for clearer picture. The second reason for not shorting Reliance was strength in the counter and if nifty would not have cracked Reliance could have led it up. Definitely not for writing this article but I knew for sure Titan has strong supply at around 3830 (I have explained couple of weeks back when explaining support and resistance) and so I was not risking much by shorting Titan at around 3740. Tomorrow many analysts will say market held the support of 5980 and so it is headed higher but beware this is not held-ing any support but cracking supports. Check out the TV tomorrow morning and share if you see anybody who says 5980 support was held. Share your views and opinion in comments below. You are here: Home / Trading / How to Trade In Market?